In a saucepan over medium-high heat, heat the sesame and safflower oils. Add the turmeric, garlic and fenugreek. Swirl around. When the fenugreek starts crackling, add the grains. Stir to cover the grains in oil. Reduce the heat to medium and add the water and carrot. Bring to a boil, lower heat and steam for 20 minutes. Preheat the oven to 425°F (218° C). Grind up the sesame and sunflower seeds in a food grinder or processor. 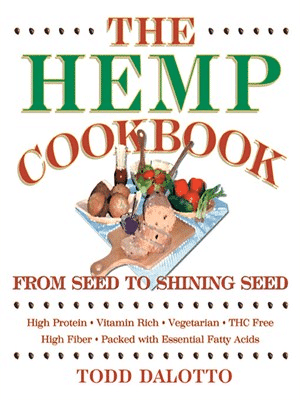 In a mixing bowl, combine the ground seeds, 1 1/2 cups of the cooked grain, the hempseed butter and the brown rice syrup. Stir. 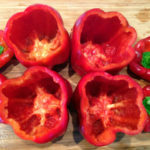 Cut off the stem end of each pepper like a jack-o’-lantern and remove the seeds. Stuff each pepper with the mixture. In an oiled iron skillet or bread pan, form a bed of the rest of the cooked grains. 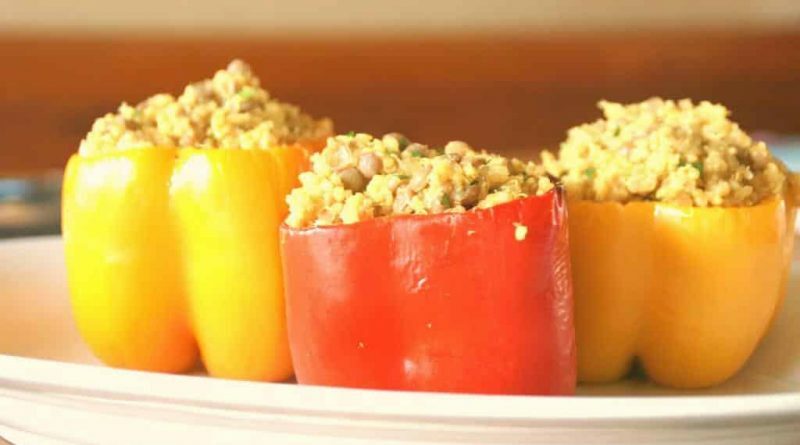 Nest the stuffed peppers into the bed of grains . 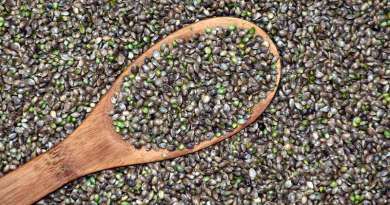 Bake for 30 minutes, then serve with a generous topping of Garlic in Hempseed Oil. You can keep this simple preparation in the fridge to pull out as needed for a flavorful addition to sauces, spreads and toast. The quality of the garlic you use is important. Be sure to use well-cured garlic. Fresh and sprouting garlic is too “live” to store and will spoil rapidly. If you see bubbles or pressure buildup in the jar, the mix is no longer healthful to eat. Make as much as you want! This mixture will last a month in the refrigerator, so peel whatever quantity of garlic you can easily eat and share in that time. Chop or mince the garlic cloves. The finer the garlic is cut, the stronger it’s flavor will be. 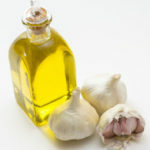 Place as much garlic as you can fit into a jar and fill the rest with a 2:1 ratio hempseed oil to olive oil. Close the lid and put in the fridge overnight before using. If the oil settles, then top off the jar with more. Variation: You can also substitute other oils for the olive oil. Try toasted sesame oil, peanut oil, flax oil and so on.